Geoff Layer has been the Vice Chancellor of the University of Wolverhampton since August 2011. He graduated from Newcastle Polytechnic with a LLB(Hons) and entered a teaching and research career initially in Manchester and then in Luton. He joined the Sheffield Business School in 1983 as a Lecturer in Law. Whilst at Sheffield Hallam University he established a suite of access and student support initiatives leading to the establishment of a national reputation for inclusive learning. He was an adviser to a range of national quality assurance and educational development initiatives and became Professor of Lifelong Learning in 1996. 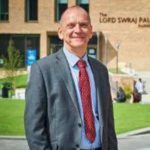 He joined the University of Bradford in 1999 and became Pro Vice-Chancellor and then Deputy Vice-Chancellor (Academic), until joining Wolverhampton. Between 2000 and 2006 he was the Director of Action on Access, an agency established to advise HEFCE on its Widening Participation Strategy. He has been a consultant to Universities UK, Higher Education Quality Council and many universities in Widening Participation and Learning and Teaching Strategies. He was also Director of the HEFCE Innovations Co-ordination Team from 2000 to 2002.